Opelika during the 19th century was on a major rail line for bales of cotton to be shipped north. As a result, many warehouses for storing cotton were built along the city’s railroad track. Today, downtown Opelika’s historic cotton warehouse district is a hub for artists and craftspeople, including husband and wife Michael and Sarah Stricklin. 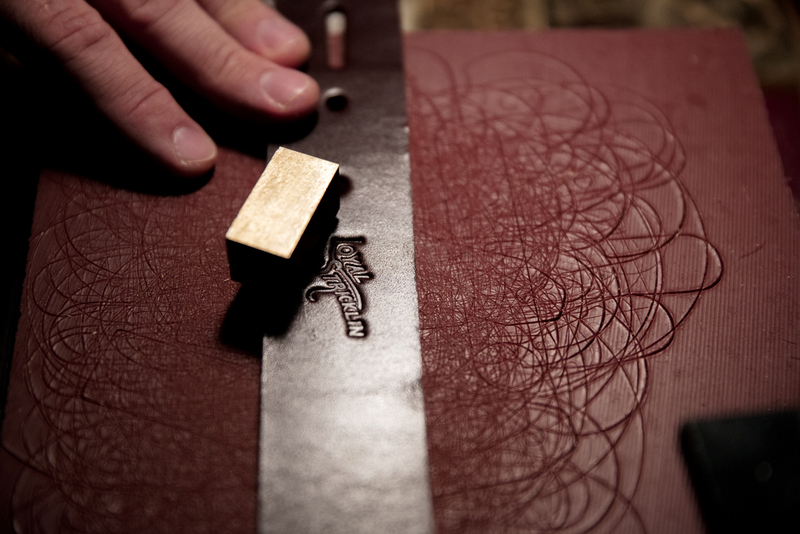 They are the creative force behind Loyal Stricklin, a leather goods company and premium lifestyle brand. They source everything in the United States when possible and purchase leather and other materials from France, Italy and Japan for special projects. Loyal Stricklin also offers a collection of carefully chosen merchandise made by other craftspeople in a traditional or non-mechanized way. They choose to work only with companies that manufacture their products ethically and pay their employees fair wages. Along with Michael and Sarah, three employees work in the studio that operates out of a former cotton warehouse. Three additional employees work in their flagship retail store a few blocks from the studio. One of their signature items is the aviator mug. Wrapped around a lidded mason jar is hand-stitched leather embossed with a biplane with a leather handle attached. It’s an ingenious alternative to the plastic or metal commuter/travel mug. 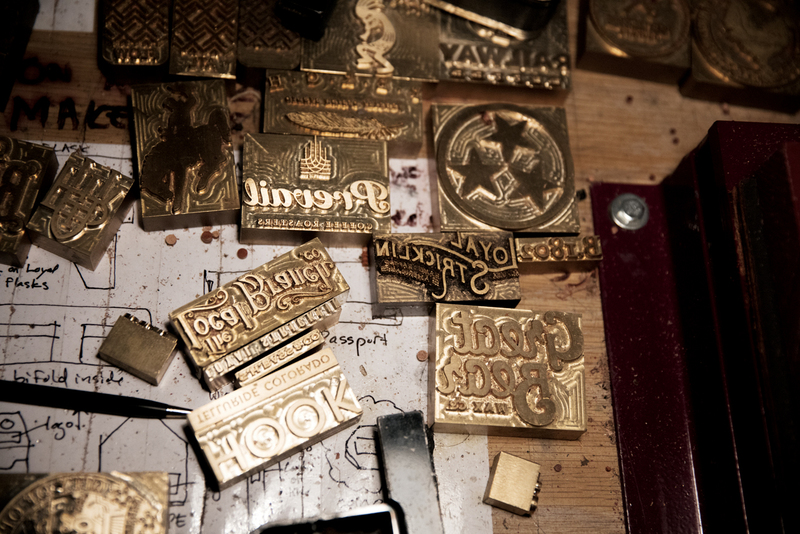 Today’s digital capabilities have expanded the handmade marketplace. 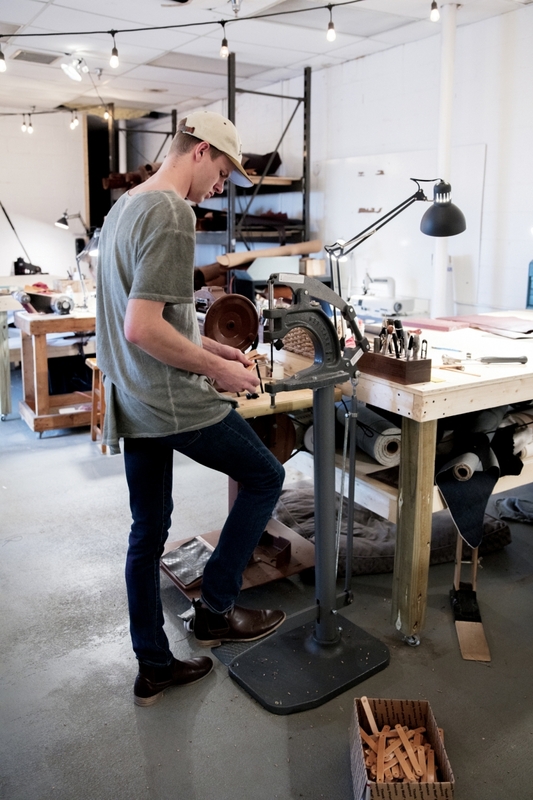 Handcrafted goods are easier to access with e-commerce sites that connect consumers directly to artisans and craftspeople. And social media makes it easier for craftspeople to access their target markets. ABOVE LEFT Michael Stricklin at the former cotton warehouse storefront in Opelika, housing the business he named for his grandfather. ABOVE RIGHT Connor Darden is surrounded by the tools of the trade. The company has always been an online business, says Stricklin, a Homewood native and Auburn University graduate with degrees in architecture and construction who named the company after his grandfather, Loyal Stricklin. The Stricklins mainly use Instagram for marketing and have used paid advertising occasionally. But they find that creating appealing content far exceeds paid advertising return in the form of pay-per-click ads. In addition, they use Facebook ads for local promotion. Their customers and some bloggers also get the word out by sharing Loyal Stricklin products on their websites and social media. Shopify is used for their website, which provides hundreds of templates to choose from. Stricklin edits the templates into something that works with their brand and how they want to present their company. They set up the product listings, organize them by category and do all product photography in house. For fulfillment, they have shipping software integrated into their website backend, which automatically imports orders to create shipments. Their shipping manager inspects each item that goes out the door. 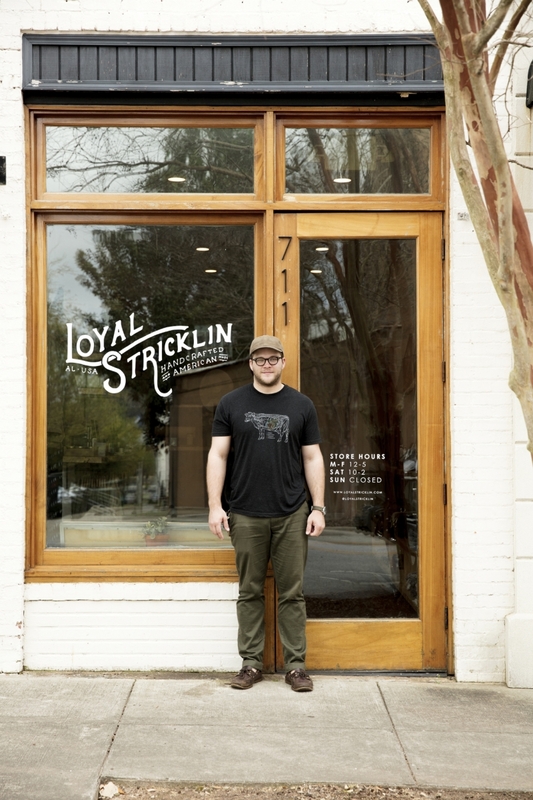 Until this year, Loyal Stricklin’s wholesale and retail business has been equally divided. The focus is now on retail, so marketing and product development have increased with less emphasis on attending trade shows and trying to get into more stores. Also key is maintaining a balance between the artistic/craftsmanship side and the business side. Their goal is to be able to have a highly trained, well-paid staff to make all of their goods. But the work is specialized. And it takes a lot of time and material to train people to sew and create to their exact specifications. Michael and Sarah typically attend two to four trade shows yearly to present their goods and find new retail partners to carry their goods. Loyal Stricklin now has retailers in many states and Asia. Businesses that carry Loyal Stricklin goods share their commitment to supporting American brands. One is Houston-based Manready Mercantile, their first retailer. Durability is taken seriously. Yet Stricklin believes a comment made online about their wallets being so well made “you’ll never need another one” isn’t realistic. Stricklin says he used to buy a new wallet for $40 once a year from a big box store and inevitably it fell apart and had to be replaced. His bifold wallets sell for $100 to $160, but won’t need replacing for many years. Stricklin doesn’t have a problem with goods made in China. The problem, as he sees it, is not being able to trace the supply chain back, so consumers can know if the shirt or jeans they are wearing were made by workers paid a living wage. The problem isn’t only when companies use cheap materials and pay their employees pennies to work in substandard conditions, Stricklin notes. That same mindset shifts to the consumer, who finds it easier to throw away items rather than repair them, since they can be replaced for a nominal cost. The Stricklins plan to stay in the former cotton warehouse, at least for the time being. 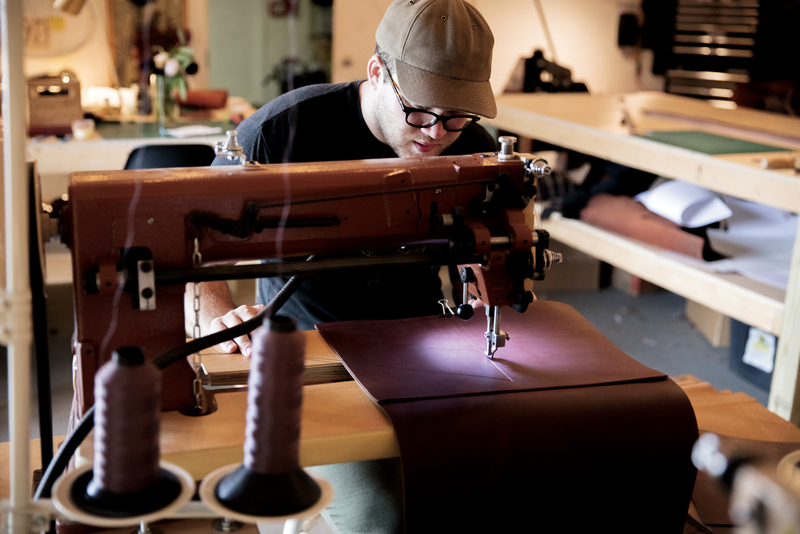 Leather production occupies only half of the building, allowing room for increased production and additional office space. Jessica Armstrong and Cary Norton are freelance contributors to Business Alabama. She is based in Auburn and he in Birmingham.